Stephen W. Terrell's (MUSIC) Web Log: THE FIGHT GOES ON! Another single-digit showing, another rousing victory speech. Dogs bark, the Richardson carnival goes on. 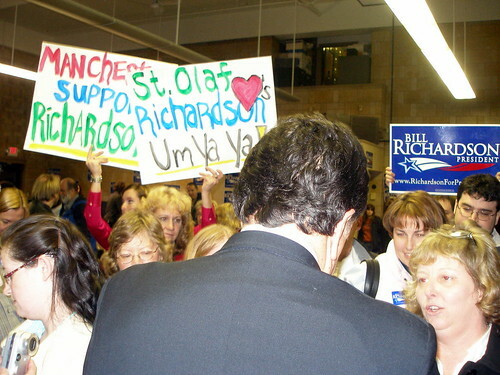 My analysis of Richardson's New Hampshire showing is HERE. Some of the experts I talked to said he might be staying in to increase his chances to get chosen for vice president or another major appointment in a Democratic administration. But I'm not sure how much it's going to help to get more 5-percent finishes. But I can't worry about that right now. I have to catch a plane back to New Mexico.